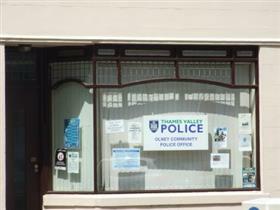 The Thames Valley Police Community office at Olney is a "service enhancement station" and the front counter is served by volunteers. It can be used for document productions, lost and found property, crime reporting via telephone to police enquiry centre, reports of suspicious activity, reports of bad driving (passed to police enquiry centre) and firearms applications. Advice is also available at the Olney office on whether or not a traffic collision is reportable (they cannot take traffic collision reports), crime prevention, neighbourhood policing and making a complaint.